I’ve just come back from Sunny California and in the last three weeks I’ve heard Donald Trump time and again calling for much more oil drilling in the USA because he says climate change does not exist. Then one of my research students (who is a Kerryman through and through) sent me a link from last week’s Irish Examiner giving a platform to the increasingly bizarre views of Danny Healy Rae about the same topic. So the headline was: To say Man is changing the weather is nonsensical. My headline would be: To say Dan knows anything about climate change is nonsensical. His fundamental point is that natural phenomena like volcanoes, caused by Superior Influences lead to climate change. And we have nothing to do with it all at all, at all. The problem is that he, like many other politicians such as Trump, have little to no understanding of science. Now people like me bear some of the blame for that because we haven’t explained matters more clearly to the general public. And we should and that’s why I’m writing this blog. If Danny knew more (or anything at all) about our atmosphere I think he might begin to be convinced by the fact that 97% of scientists with expertise in climate change believe that the enhanced effect is caused by us. And they have good reason! His main problem is that he repeats half-truths without any knowledge of what part is true, what part is irrelevant and what part is utter nonsense. So I have written some full truths for Danny below. His fundamental misunderstanding is not being able to distinguish between the BASELINE Greenhouse Effect that makes our planet habitable and the modern ENHANCED Greenhouse Effect, that started with the Industrial Revolution in about 1850, and will make the Earth uninhabitable in the future if we are not careful. (See some of my previous blogs here on the CRAC page). The presence of an atmosphere is crucial: so if Kerry was on the Moon, which we all know does not have one, then the temperature in Kilgarvan would be about -18 C.
OUR atmosphere naturally contains water vapour, ozone and carbon dioxide, all of which retain heat originating from the Sun and so we have a planet that has reached a Goldilocks temperature. Not too hot and not too cold. Just right, Daddy Bear. It’s this phenomenon, which is often called the natural (or baseline) Greenhouse effect. But the enhanced Greenhouse effect is better described by thinking of the atmosphere as a woolen shawl with holes in it. If the wool is made thicker by putting more carbon dioxide in the atmosphere it gets hotter or if we fill in the holes by putting in other gases like methane and nitrous oxide, we get even hotter. We also get hotter if we put soot particles in the atmosphere by, say, burning tropical forests down. Because those particles absorb heat and so we get further temperature increases. But some particles reflect heat away from planet Earth making it cooler. And sulfate particles thrown into the atmosphere by a volcanic explosion are examples of this. As it happens in 1737 there were two massive volcanic eruptions that threw an enormous number of sulfate particles and droplets into the atmosphere. Now it takes about 2 years for these to circulate round the globe and during 1739 a big freeze happened that killed crops! And Danny’s Irish famine started! It’s not the only time on the planet that something like this has happened when a volcano has erupted…..check what happened in 1815 at the time of the Battle of Waterloo. All of the above shows is that understanding global warming/climate change is difficult….but not impossible. Why are 97% of climate scientists convinced that the enhanced effect is man-made? For context global warming was predicted in 1896 by a scientist who won the Nobel Prize in Chemistry in 1903. He said that if we doubled the amount of carbon dioxide in the atmosphere, we would experience a 5 or 6 degree centigrade warming of the planet. That’s just about what our computer models predict now! Fortunately, the world is waking up to climate change problems and graphics like the temperature increase spiral shown at the opening ceremony of the Rio Olympics and also Leonardo Di Caprio’s acceptance speech at the Oscars this year all help. Personally I think it is time to get scared for the next generation. There was a very large increase in carbon dioxide in our atmosphere between 2015 and 2016 (4 ppmv). Over the same time period we experienced yet another series of all time temperature highs over the planet….and Arctic ice is melting at an unprecedented rate. 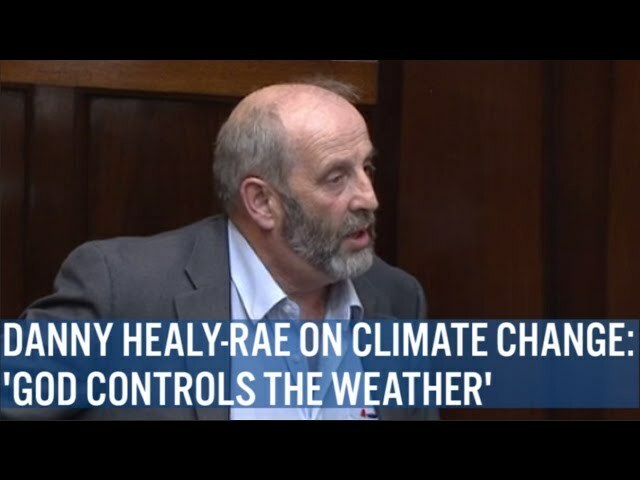 So we may be there, certainly close to a tipping point and that’s why the views of people like Danny Healy Rae are dangerous…but only if people believe him. If you need more information, Danny, go to the crac.ucc.ie website. We’d love to see your footprint.